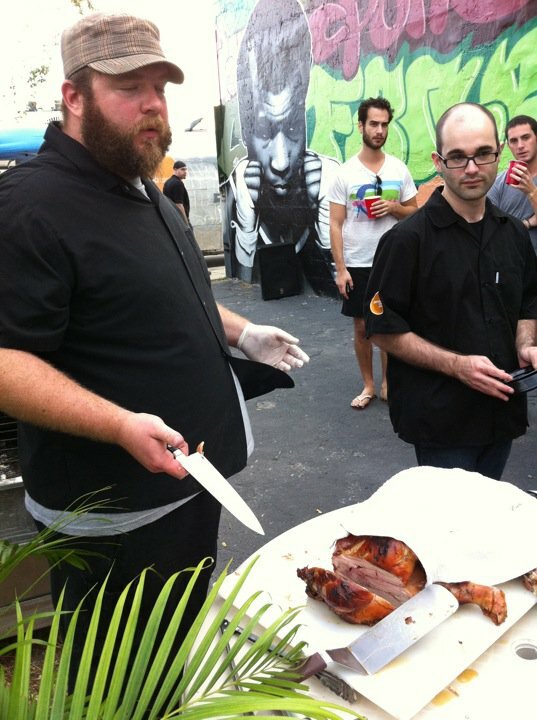 food for thought | a miami food blog: This Little Piggy Went to P.I.G. This Little Piggy Went to P.I.G. It's hard for me to believe it's been a year since the inaugeral "P.I.G." (Pork Is Good) event, a celebration of all things porcine by Chef Jeremiah, pilot of the gastroPod. Indeed, a year ago, there wasn't even a gastroPod yet: just a hard-working chef with the slightly crazy-sounding idea of retrofitting a vintage Airstream trailer with a 21st century kitchen, and bringing Miami some creative but budget-friendly mobile food. [*] We had some good stuff that day: chicharrones, banh mi trotter tacos, pork belly Cuban sandwiches, East meets South pulled pork char shiu bao, home-made hot dogs, a whole roasted pig done in the Caja China, and some moonshine/black cherry cocktails to wash it all down. Some of those items, in one form or another, eventually became gastroPod menu items. With nearly a year of trucking under his belt, Chef Jeremiah put on the "second annual" P.I.G. event this weekend, at GAB Studio in Wynwood. Though I only had a short time to run in and out and would have liked to have stayed longer, I did get a quick sampling of this year's P.I.G.-fest. "Prosciutto and Melon" was actually not prosciutto, but rather some country ham from Allan Benton, paired with a cold and vividly flavored melon gelée. Benton's hams, produced in Madisonville, Tennessee and aged between nine months and a year or more, are a ridiculously delicious product and a real treat. "Tongue in Cheek" was a, well, tongue in cheek take on tongue, and, y'know, cheek. Here, "tongue" = beef tongue, "cheek" = pork cheek, and the unifying inspiration for the flavors was a tongue sandwich from a New York deli. The meats - the tongue thinly sliced, the cheek in a heftier slab - were layered over a slice of pumpernickel bread, with a bright purple slaw and a squirt of deli mustard over the top, and pickled okra standing in for the classic pickle on the side. It was enough to get you thinking that what Jewish delis need is perhaps more pork products. "Roast Suckling Pig" showed the pork Zen master at work. Next time I'd like to actually see Chef Jeremiah's butchery work on this suckling pig (fresh from the farm in Hialeah only 48 hours earlier): while keeping the frame of the pig intact, Jeremiah bones out all of the torso and wraps the belly around the loin, making for a porchetta-like round of meaty goodness, which he marinates and then cooks in the Caja China. It comes out with beautifully crispy bronzed skin, and still plump and juicy inside. I got there just in time to lay claim to a crispy ear as he was carving it up. To finish things off, a little ice cream for dessert: "Carbonara Ice Cream" that is. A twist on the modern classic egg and bacon ice cream served by Heston Blumenthal at The Fat Duck, this was eggy, smoky, a little bit meaty, and just fantastic with a strip of dried, sugared Benton's bacon. If I could have wished for one thing, it might have been a grind of some pepper to reinforce the carbonara reference point, and which I think would have worked perfectly with the flavors. This was a great sampling of pig in various forms, and there was a really nice group of people who came out for it. I only wish I'd had a little more time to enjoy it, and am already looking forward to P.I.G. 3. [*]On a related note, Latin Burger reminded me just a couple days ago that it was almost exactly a year ago that FFT previewed the impending food truck invasion. Hey, for all you La Caja China owners in Miami - La Caja China and I have (finally) released our first cookbook, "La Caja China Cooking." Lots of traditional Cuban recipes, as well as Southern US favorites, and a few from around the world!